Constructed in 1917 as a food warehouse, the three-story 24,000 sq foot building served as a wholescale food distribution point for western ND cities served by the NP Railway including New Salem, Glen Ullin, Hebron, Richardton, Flasher, Elgin, New Leipzig, Mott, Hazen and Beulah. The building was constructed at the site of the former Northern Pacific Railroad's first passenger depot on the south side of the intersection of Main Street and Collins Avenue. 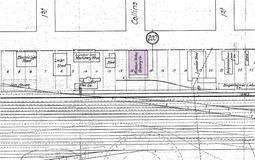 That wood depot was expanded and converted into NPRR's first freighthouse when the "Queen Anne" style passenger depot opened in November 1882 four blocks west. The previous building burned to the ground on March 8, 1910 in a spectacular fire. 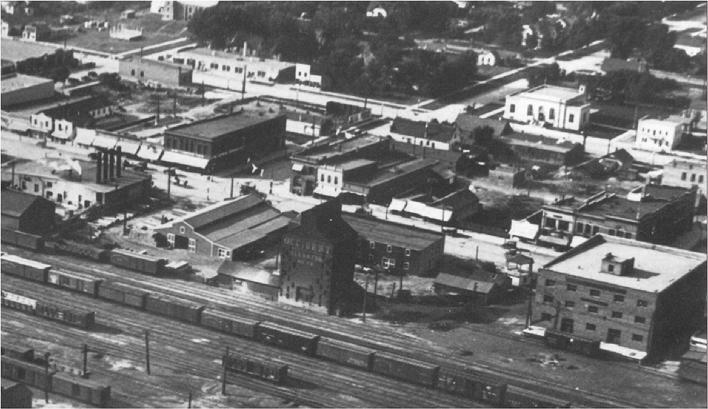 When the NP Railway decided to rebuild a freighthouse on west Main Street and avoid frequent spring floodwaters, a business group headed by Hiram Lyon, purchased the lot. The site was ideally located for them, adjacent to their lumber, elevator and farm implement sales and service buildings to the west. It also stood across Main Street from Lyon's First National Bank. The new warehouse would be in the heart of the commercial district with an existing rail spur. The building continued to be in active use by the Missouri Valley Produce Company through World War II and the late 1940s. However as truck transportation industry grew in size and was more flexible in the movement of fresh produce, the importance of rail transportation decreased. It was purchased in 1953 by the John Iverson Company and used as an electrical and lighting supply warehouse and wholesale distributer. They closed their operation in 1992. Several attempts were made to return the building to active use. In 2008, a feasibility study proposed a multi-use facility including a children's museum and a non-profict food cooperative. In 2010, a proposal for use as non-profit cooperative for microshops, art gallery and “Pride of Dakota” store was advanced. In February 2012, building owner Al Leingang announced his partnership with Loran Galpin of the Galpin Company Inc., to renovate the building as "Plaza Square on Main." Promising to do something "exceptional" with the building, the city granted a series of property tax exemptions and TIF financing totaling $735,000 over a 15 year period. The project will also qualify for $20,000 in state tax savings. Work must start before May 2013 and the entire project be complete by end of 2016. All three floors will be renovated as office space, or mixed use office and living areas. A large facade including a glass-enclosed elevator and stair tower will be added on the east side of the building, with a courtyard and fountain to be placed in front of it. The north and west side of the building will retained for its historic value. The concrete pillars and a scale left over from the building's days as a food warehouse will remain in place. 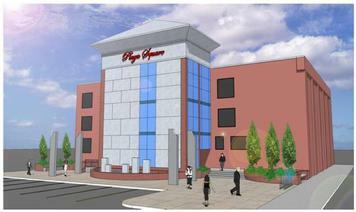 The exterior of the building will be a $2.1 million investment, Galpin said. After second and third floor renovations are complete it could come to about $3.3 million to $3.6 million. Leingang also owns about 1.2 acres of empty property east of the building, leaving space for parking.